On Saturday, January 12th, 2019, we held the 4th Meeting at the Yamanashi International Association Conference Room. It was the 1st meeting in the year 2019! We had 14 people including 2 new members, 4 Non-Toastmaster guests, and 5 Toastmaster guests from other clubs. At the beginning of the meeting, our President, TM Y.K. introduced about Toastmasters activities as usual. This time, we also watched a video which introduces Toastmasters activities, which was provided by Toastmasters District 76 (Japan). Also, President Y.K. announced that. We, Kofu Toastmasters Club had application for “the 500th Anniversary of Establishing Kofu Project” and was shortlisted—we are planning to hold an event on June 29, 2019! We are so excited about the Kofu500 special event! After the introduction, our club officer TM S.K. made a motion to welcome two new members. We held a discussion and decided to welcome both two members and held the Induction Ceremony to welcome these two members. Those two members are now becoming “Toastmasters” officially! 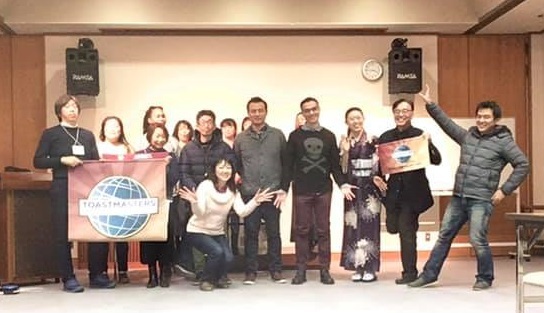 Welcome to Kofu TMC, and welcome to our Toastmasters journey! Now, let’s start today’s educational session! Our Toastmaster of the Day (TMOD), TM Y.M. introduced the meeting schedule. His opening speech was very passionate—we could feel his love for our Kofu TMC and Kofu City as well! Next, our new member, TM S.S. introduced Word of the Day “compassionate.” Word of the Day is a keyword of the meeting, and members are requested to use this word as many times as possible. It was the very first role for TM S.S. Congratulations! Also, TM Y.A. is our another new member, introduced the role of Ah-Counter. Ah-Counter’s role is to count unnecessary words we unconsciously use when we are speaking in the public. This role is important to improving speakers’ speaking skills, to deliver their message properly. This role was the 1st role for TM Y.A. as well. Congratulations! Next, we moved on to the Prepared Speech Session. Our 1st Speaker today was TM T.T. Her speech was based on an Advanced Communication Manual “the Entertaining Speaker,” and her project was “Speaking After Dinner.” She delivered English Rakugo, with a story of visiting Tenjin Shrine for the first Time. It was a perfect topic for the new year, and her speaking skills as a Rakugo performer was shining. Our next speaker was our guest, TM P.M., who was the Finalist of District 76 (all Japan) in 2017. His speech was related to everyone—expressing your true thoughts with others. Especially in terms of politics, people are less likely to share their true opinions with others. His speech reached our hearts, hesitating to speak up. 3rd Speaker was our member, TM R.K., who was also the finalist in 2018. Her speech was based on the Advanced Communication Manual “Special Occasion Speeches,” and her project was “Presenting an Award.” She awarded an original award to our founder / President, TM Y.K., for his hard work. After the Prepared Speech Session, we had a break and moved on to the Table Topics Session, the impromptu speech. The facilitator of this session, Topicsmaster, was TM K.S. (TM guest). He asked various questions, to those who had fewer opportunities to speak up during the 1st half of the meeting. His questions were, “What was your worst thing you bought in your life?” “Which film made you cry recently?” “What is the best technology in the past ten years?” “Who was the best teacher in your life?” and “If you could reborn into any person, who would you like to be and what would you like to do? “All of the speakers, including guests, delivered great impromptu speeches, answering the questions. The last part of the meeting was the General Evaluation Session. Each Speech Evaluator evaluated each prepared speech. Each Evaluator had one’s own style of evaluation and mentioned detailed parts of the speeches, which helped both of the speakers and the audience to understand. This time all of the Speech Evaluators were Toastmaster guests from other clubs. Thank you very much! After the speech evaluations, each helper reported the results: Word of the Day, Ah-Counter, and Grammarian. Then our General Evaluator (GE), TM Y.M. evaluated the meeting. TM Y.M. praised first timers (those who took the role for the first time), and all the speakers and other role takers. However, the hardest worker of the day was TM Y.M. himself—he took the double role of TMOD and GE! I think it was the hardest combination in the Toastmasters world... Thank you very much! Our meeting will be held on Saturday, February 9, and March 9, 2019. If you’re interested in our activities, please feel free to contact us! Copyright © Volunteer Association of Yamanashi. All rights reserved.